I have always been a fan of characters in video games, television shows and movies who know how to wield a mighty bladed weapon. This has led to my often pricy hobby of knife and sword collecting. Any fool can use a firearm, but it takes real skill to effectively slash and hack your way through your foes. 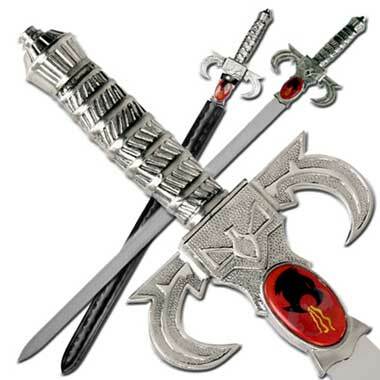 These swords are in no particular order since each has their own uniqueness and story to go with them. I tried to balance out the equation by providing swords from movies both recent and less recent. Please feel free to leave anything I should have included in this list in the comments. 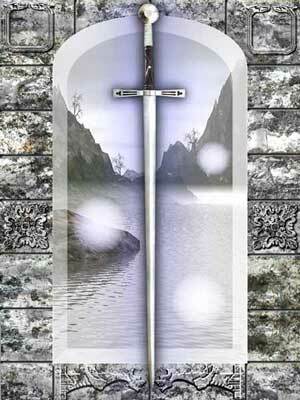 Kicking off the list at number 10 we have The Sword of Omens. Any child of the 80’s should remember this cartoon series. More mighty than anyone else of his age, young Lion-O was only 12 years old when he and his Thunderian teammates sought refuge on Third Earth while their home planet of Thunderia was being destroyed. Upon arrival, Lion-O and his allies fought against the tyrannical Mumm-Ra and his hordes of evil fiends who sought to not only destroy The Thundercats, but also obtain great power from The Eye of Thundera, the jewel inlayed within the hilt of The Sword of Omens, which is the source of The Thundercats’ own power. The classic 1820 story of The Legend of Sleep Hollow by Washington Irving was again adapted to film in 1999. As the story goes, Ichabod Crane is sent to Sleepy Hollow to investigate and put a stop to the Headless Horseman who has been terrorizing the town. Riding upon a black horse, The Headless Horseman stalks his seemingly random victims at night and uses an ominous looking double edged sword to remove the heads of those unfortunate souls. The motives behind the murders are eventually unraveled as Crane’s investigation continues. The real twist for me is that Christopher Walken is The Headless Horseman. This movie is one of my personal favorites and the sword Dar uses is equally impressive. There is an evil priest Maax who has revealed to him a prophecy concerning the birth of a child who will eventually kill him years later. Maax is determined to put a stop to this at once and sends one of his evil minions out to find this unborn child, brand it with a sign of their evil deity then and sacrifice it. As fate would have it the baby is saved by a man who lives in the village of Emur. This is where Dar grows to be a strong young man. Eventually Dar realizes that by being branded with the sign he was given the ability to psychically communicate with animals and this power will come in handy after his entire village and all of its inhabitants are slaughtered by the wicked Jun Horde. It seems that Maax has been looking for Dar all these years and his search has led him to the village of Emur. Dar survives the attack and as the last living member of the Emurite clan he seeks vengeance and uses his adoptive father’s mighty sword along with his psychic power to fulfill his destiny and make the prophecy become a reality. It came into hobbit hands when Frodo’s adoptive uncle Bilbo Baggins stole Sting from a band of orcs and used it to fight with. 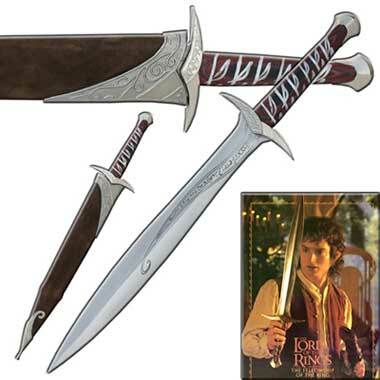 The name Sting was given to the sword after Bilbo’s encounter with a bunch of huge arachnids. Bilbo used it many times over the years until Frodo required a weapon for himself as he set out on the quest to destroy The Ring of Sauron. I grew up watching this cartoon series as a child so I had to throw this one on here. Looking back I now realize all of the sexual innuendoes within the series. As the regular average Prince Adam no one really cares about him, but when he takes the power sword out, points it in the air and shouts “By the power of Grey Skull…I have the power!” he is magically transformed into He-Man, the most powerful man in the universe, capable of any feat. No one ever figures out that they are one in the same person despite looking identical. Although his sword is mighty and magical, he rarely uses it. Instead he uses his immeasurable strength and wit to overcome his foes and constantly defeat Skeletor. 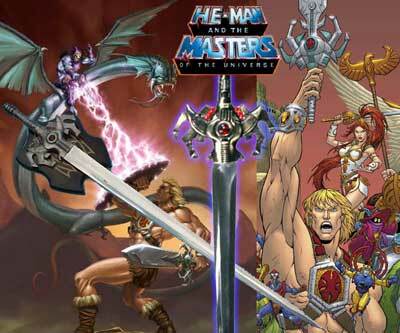 If you are a die-hard He-Man fan still to this day then read below. Inigo is a straight shooting Spaniard and the child of a sword-craftsman. Whilst learning the craft, Inigo’s father was approached by a unique man of nobility who requested a very custom and equally costly rapier; a jeweled rapier that would befit a six fingered man. After the extensive completion of this sword, the six fingered man refused to pay the agreed amount for the rapier and subsequently murders young Inigo’s father right in front of him. 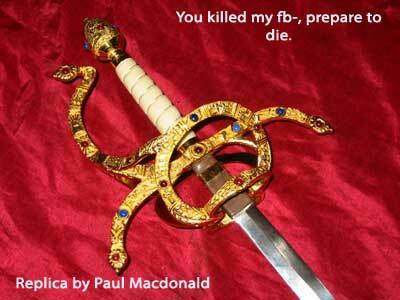 The six fingered man left Inigo alive, but not before he gave him two scars, one across each cheek. Romantic and steadfast, Inigo, in his life-quest to avenge his father’s tragic and unwarranted death, would eventually track down the six fingered man and slay him with the very same rapier. 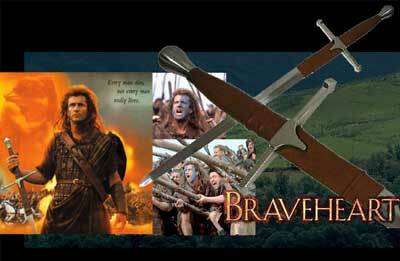 The character of William Wallace was magnificently portrayed by Mel Gibson in this epic film. I remember watching the movie for the first time and my jaw dropped when I saw that massive sword strapped to his back as he rode his horse around his fellow countrymen in preparation for battle. Although the film is a classic a lot of the actual facts about the real life William Wallace have been lost. It is known that Wallace was a fighter against the oppressive English rule during the 1200’s, but the huge sword used in the movie by Gibson was most likely never actually used by the real William Wallace. The real William Wallace’s sword is on display in Stirling, Scotland at The National Wallace Monument and it looks nothing like what is seen in the movie. That doesn’t stop this huge two handed sword from being an awesome weapon though! Come on now! You didn’t really think that I would leave this awesome weapon off the list did you? 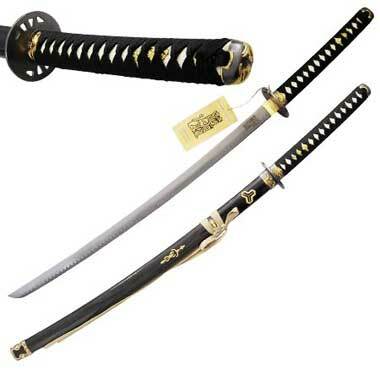 While the blade is not made of metal like the other 10 this weapon could not be ignored. When one thinks of Star Wars the lightsaber should spring immediately to mind. Luke had one, Vader had one, Yoda had one; the one single weapon that you need after you choose to pursue a life working with the power of the force is a lightsaber, no matter what side of the force you choose.